Built as a fortress town to command the Dordogne Valley, Domme is still famous for its commanding panoramic views of this exceptionally beautiful region. The medieval hilltop town of Domme, 14 km (9 miles, 22 minutes) south of Sarlat-la-Canéda (map), was fortified in 1283 to keep a military watch on the Dordogne Valley. It still fullfills that purpose, but for tourists, not soldiers. From this rocky promontory, the panoramic views of the lush, fertile Dordogne countryside, with the river winding through it, are reason enough for a visit. Add to the views the well-preserved medieval streets, houses, church and fortifications, a handful of good hotels and restaurants, verdant parks, and the promenade along the fortifications, and Domme becomes a Dordogne must-see destination. 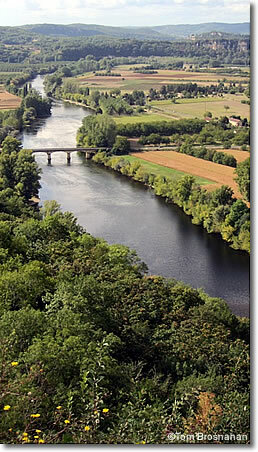 Come for a few hours or more as a stop on your rambles through the Dordogne valley, or stay overnight and enjoy the tranquillity and historic ambience apparent after the crowds of day-trippers have departed. Being a walled hilltop town, Domme has very limited parking within its walls. In the busy summer months (June through mid-September), it's best not to waste time attempting to enter the walls to find a place to park your car. Rather, head for one of the larger, less expensive parking lots lower down the slope. The lowest, farthest is free of charge, and provides free shuttle rides to the hilltop. Walk to the top of the hill and you'll find the Office de Tourisme next to the historic church and, beyond them, the promenade with spectacular views. A few café-restaurants provide drinks and meals with the view in sight.